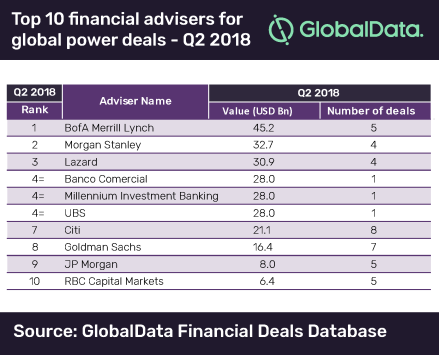 Bank of America (BofA) Merrill Lynch has claimed the top spot in the latest power industry financial advisers M&A league table for Q2 2018, compiled by leading data analytics company GlobalData. The American investment bank topped the table by value, with $45.2bn across five deals, including the top three deals in the industry. GlobalData compiles the league table using its tracking data of all merger and acquisition, private equity/venture capital and asset transaction activity globally. According to the company, Morgan Stanley and Lazard trailed BofA Merrill Lynch, recording four deals each with a combined value of $32.7bn and $30.9bn, respectively. The industry’s biggest transaction during Q2 2018 – China Three Gorges’ 76.7% stake acquisition in EDP worth $28bn – helped those companies associated with the deal gain entry into the top six ranking places. Citi secured first place by deal count, with eight deals during the quarter, followed by Goldman Sachs with seven deals, ranking 7th and 8th by value, respectively. The overall deal activity in the power sector saw an uplift in value, while volumes remained almost flat during Q2 2018 compared to the same quarter in 2017. Value jumped by over 30% from $76.3bn in Q2 2017 to $99.6bn in Q2 2018. 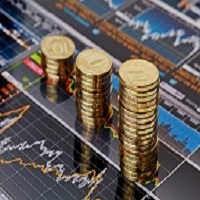 Volume achieved a marginal rise of 1.8% from 547 to 557 deals during the review period. Morgan Stanley, which stood second in the Power league table of M&A financial advisers, was top-ranked in the global league table of top 20 M&A financial advisers released by GlobalData recently. Goldman Sachs and JP Morgan, which were among the top three advisers globally, slipped to 8th and 9th positions in the power sector ranking. 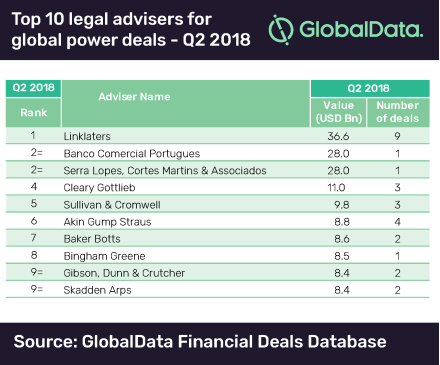 London-based multinational law firm Linklaters led the field of legal advisers for power deals, advising on nine deals worth $36.6bn, followed by Banco Comercial Portugues and Serra Lopes, Cortes Martins & Associados, with one deal each.